I. Preliminary Discussion of the Question of Analytical Training. to a conference on the whole problem of analytical training and especially on the plan of forming an international training organization, in order that there might be a uniform system of psycho-analytical instruction in different countries. The object of the conference was to discuss the matter in detail and to prepare a resolution for the General Meeting. The Branch Societies of the International Psycho-Analytical Association were represented by some forty members. Dr. Ferenczi was in the chair. 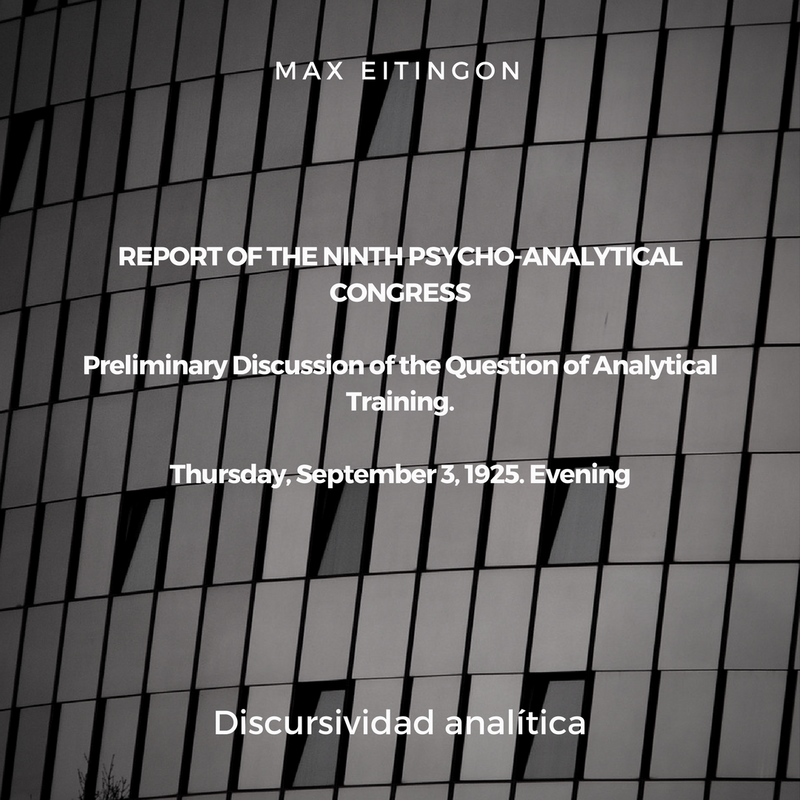 I should like to introduce the present important discussion on the problem of psycho-analytical training by laying down certain proposals for which I will then try to give good grounds. a.​Psycho-analytical training ought no longer to be left to the private initiative of individuals. b.​When a candidate presents himself for training, at least the Psycho-Analytical Society of the country in which he lives must collectively make itself responsible for him. For this purpose the different countries ought to provide Institutes, to be run, mutatis mutandis, on the same lines and as far as possible of the same type. It therefore seems to us best for the International Psycho-Analytical Association authoritatively to make regulations for training. c.​Instructional analysis is the most important part of the training but it does not constitute the whole. It is absolutely essential that we should demand and give opportunity for further training, including, above all, the conducting of analyses under supervision. d.​We should like in future to lay down, as a deduction from these three statements with regard to training, that, as a general rule, those who wish to practise psycho-analysis must have completed the whole training before they can become members of the International Psycho-Analytical Association. This would do away with the troublesome problem of certificates or diplomas. developing that which Freud has created, to guard it from a premature fusion and so-called synthesis with other fields of thought and different methods of investigation and work, and ever to give clear definition to that which is specifically our own. Now the fate of our work is in the hands of our successors, and it is to them more and more that we must turn our attention. We must endeavour to meet this our most pressing need by making suitable provision. This purpose is, however, far less difficult of execution than would appear. Seven years ago, at the Fifth International Psycho-Analytical Congress in Budapest, Dr. Nunberg, a member of the Vienna Society, first proposed that in future every analyst should himself have been analysed—a demand which most of us thought could never be realized. And yet since then it has become a matter of course, extra muros etintra. The scope of psycho-analytical knowledge and efficiency is now such that it is only collectively that the requirements for training can be adequately met. Of course I need not point out that throughout our discussion we are leaving Freud himself, with whom no one else can be compared, entirely on one side. The training ought to be undertaken by Institutes which either already exist or will have to be founded by the Branch Societies. In Berlin and Vienna such Institutes are already at work, London has drawn up a programme for a Psycho-Analytical Institute, and the valiant little Budapest Society has already a Training Committee. You are already familiar with the regulations for training at the Berlin Institute, and the last number of the Zeitschrift published the programme of the Vienna Training Institute, whose system is largely in agreement with ours. The whole course of training (I am speaking only of training for the practice of therapeutic psycho-analysis) should be deputed to committees chosen and controlled by the separate Branch Societies and invested with full authority. Individual members of the Association, apart from these committees, ought to refrain from undertaking the training of analysts on their own responsibility and should leave such training to the committees. The International Psycho-Analytical Association should as far as possible work out a standard of uniform principles and should exact the same qualifications for the training of candidates, though at the same time local peculiarities must be taken into consideration. The Training Committees of the separate Branches would have in the first instance to decide whether the candidates presenting themselves were personally suitable. They would then have to appoint a number of analysts who seemed to them competent to conduct instructional analysis and would have to make definite plans for the rest of the training and, above all, to try to put them into practice. that anyone who wishes to become an analyst should be analysed himself, this instructional analysis alone does not actually qualify him for the work, especially if we assign to this part of his training a period of time which is in practice inadequate. I will not here enter any further into the problem of the technique of instructional analysis. There is really no question of an essentially special technique, for instructional analysis is simply psycho-analysis, and there is only one psycho-analytic technique, namely, the correct one. The point in which instructional or didactic analysis differs from therapeutic analysis (I must ask for your indulgence if I am obliged to emphasize trivialities) is not in having a special technique but, as we say in Berlin, in having an additional aim, which supersedes or goes hand in hand with the therapeutic aim. I mean that during a didactic analysis the analysand should at the same time also be acquiring theoretical knowledge. I will not dwell any longer on this point, because I wish to lay special emphasis upon another phase of the training which hitherto has not received sufficient consideration. I need only touch upon the question of theoretical training, for that question is in itself a simpler one. If a good systematic plan of lectures and seminars is drawn up for the candidates and they are grouped in suitable classes according to the stage they have reached, it will be quite possible to deal with and transmit to them the further knowledge of analysis which is necessary. If the teaching staff is a good one, and especially if its members are as far as possible in agreement, it will be so much the easier. Thus in his own analysis and in lectures the student can learn a great deal, but there is one thing which he cannot learn in this way—I mean, how to apply to living patients that which he has learnt in himself and from lectures and books, that is to say, how to recognize in patients what he already knows and not to be led astray. Now the part of the training which I specially wish to emphasize here is that of practical work under direction. Obviously, this can be carried out best and to the most considerable extent only in Out-patient Clinics, but in a lesser degree it is independent of the existence of such clinics. Here in Berlin we have had plenty of opportunity to see how helpless, when confronted with a patient, the analyst who comes straight from his so-called complete analysis as a rule is. We can distinguish different types of inadequacy, and even the best instructional analysts often cannot adequately guard against them. the budding analyst and fragments and derivatives of the complexes which have been worked at in himself in his instructional analysis. Under the guidance of an experienced analyst all these can soon be got rid of or sometimes even turned to good account. Some of the more gifted students accept en bloc the technique of their own analyst, which they have carefully observed, but they follow him too slavishly, and do not realize that the particular line taken by their own individual analysis, and its concrete features, have been largely determined by the peculiarities of the object, that is, of themselves. The student who appears to be faithfully copying his instructor enters on therapeutic analysis as a quite naïve “solipsist”, who has still to acquire that knowledge, by no means easy to come by, which supplements the Indian ta twam asi: The patient on the sofa before you is not you yourself. Then there is another group of students: those who are too diffdent and too ready to wait. They display an excess of caution and anxiety, which naturally carries with it the risk that they will let slip the moments in which the real analysis of the individual case must actually begin. It is quite understandable that beginners who have no material for comparison should be specially at a loss as regards the tempo of analyses. They are not sure what constitutes advance, progress and development in the particular analysis which they are conducting; they are uncertain how it is moving and sometimes whether it is moving at all. And yet they have already experienced the beginning and the progress of at least one analysis, namely, their own. You can surely imagine how chimerical the conception of the end of an analysis is to the beginner at first, because for practical reasons it is by no means certain that he has experienced what it means to finish an analysis. And yet, in order to make a good beginning, we mortals must be able to form some idea or arrive at some definition of the end of what we begin. The beginner in analysis can only learn all this in time and by roundabout ways, which are too long and too costly (especially for the patient). Moreover, there is a great danger that the mistakes and lack of skill of his first independent work will, either directly or by their over-compensation for them, develop into constitutional defects. You will admit that one can only regard with anxiety the progress of a young colleague who, after being analysed for six months, sets up as an analyst in a town where he is quite alone or at best has only a single colleague, himself not fully trained. With a cry of distress he turns to the Council of his particular Branch Society with a request that they will lend him, a mere tyro, support by some contact with the group—he would like sometimes to come to the meetings, etc., etc., for in the place where he has settled there is no psycho-analytical literature and no stimulus. he needs in any adequate degree by entering into a loose relationship with a Branch Society. Instead of this, he ought to go, as it were, into a psycho-analytical workshop and enter into a longer and firmer relationship of work and study with an experienced, independent analyst, as his apprentice, his assistant or, I would rather say, his journeyman. For the work of therapeutic psycho-analysis is so exact and demands such an unexampled expenditure of time and personal effort that I know of no better comparison than that of the fine old handicraft guilds, which have been crushed out of existence only by the modern laboratory, the modern national schools and the modern factory. We have already more than once described the method of analysis under supervision as practised at our Berlin Institute. Our experience in this respect has been very happy. We lay much less stress on the idea that it must be done exactly in this way and in no other than on the fact that it must be regarded as an indispensable part of the training. The procedure of the analyst supervising the beginner is of course quite different from that of the analyst who conducted his instructional analysis. The former can show him that he is making mistakes and what it would be better to do and, in relation to or by deduction from the material afforded by the patient or patients, can acquaint him with the results of the latest research. When the supervisor knows the beginner better, he will easily be able to show him why he makes mistakes, that is to say, in what complexes in himself they originate. And thus he helps him to carry on his own analysis at the same time in certain points. For the young analyst who has learnt things for himself for the sake of others now learns from others for himself. In this connection the question arises whether we in Berlin are right in our principle that the same analyst should not conduct the instructional analysis of the candidate and later supervise him in the practical part of his training. Some of the members of the Vienna Society have objected that whoever has analysed the candidate will be the most suitable person to supervise him, for he is acquainted with the complexes of his former analysand. But, as I have already said, the supervising analyst will soon detect such mistakes of the beginner as arise from his complexes. Besides, mistakes are not made only because of still unresolved complexes. There is, further, the very obvious and important fact that, as even we analysts of longstanding must confess, analysis is a very difficult art. (This art is long and the instructional analysis is short.) In laying down the principle which we follow in Berlin we were also specially influenced by the consideration that the beginner ought to see more than one individual analyst at work. Our methods of training have well stood the test of nearly five years. I now invite discussion of them. took part: Drs. Jones, Glueck, Oberndorf, Simmel, Stern, Federn, Sachs, Radó, Bernfeld, Eitingon, Ferenczi and Coriat. Finally, when all those present had signified their agreement with the essential points in Dr. Eitingon’s proposals, the President asked Dr. Radó to bring forward a resolution in this sense at the General Meeting.